The ventricles of the brain are a communicating network of cavities filled with cerebrospinal fluid (CSF) and located within the brain parenchyma. The ventricular system is composed of 2 lateral ventricles, the third ventricle, the cerebral aqueduct, and the fourth ventricle (see the images below). The choroid plexuses are located in the ventricles produce CSF, which fills the ventricles and subarachnoid space, following a cycle of constant production and reabsorption. Meninges and ventricles of the brain. The ventricular system is embryologically derived from the neural canal, forming early in the development of the neural tube. The 3 brain vesicles (prosencephalon or forebrain, mesencephalon or midbrain, and rhombencephalon or hindbrain) form around the end of the first gestational month. The neural canal dilates within the prosencephalon, leading to the formation of the lateral ventricles and third ventricle. The cavity of the mesencephalon forms the cerebral aqueduct. The dilation of the neural canal within the rhombencephalon forms the fourth ventricle. The lateral ventricles communicate with the third ventricle through interventricular foramens, and the third ventricle communicates with the fourth ventricle through the cerebral aqueduct (see the image below). 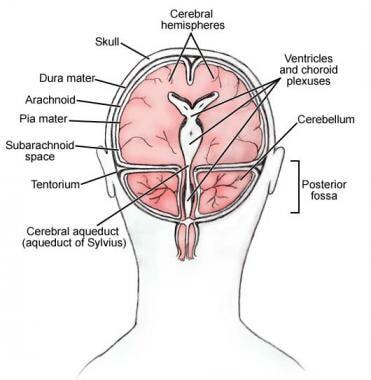 During early development, the septum pellucidum is formed by the thinned walls of the 2 cerebral hemispheres and contains a fluid-filled cavity, named the cavum, which may persist. The ventricular system of the human brain. The largest cavities of the ventricular system are the lateral ventricles. Each lateral ventricle is divided into a central portion, formed by the body and atrium (or trigone), and 3 lateral extensions or horns of the ventricles. 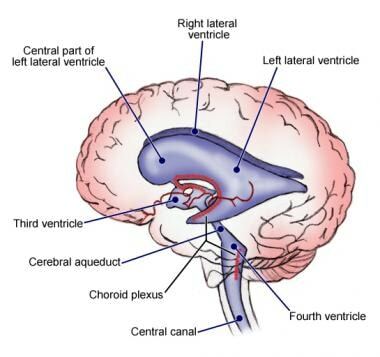 [1, 2] The central portion or the body of the ventricle is located within the parietal lobe. 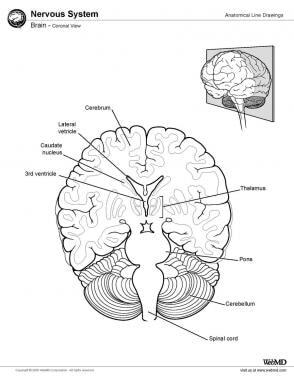 The roof is formed by the corpus callosum, and the posterior portion of the septum pellucidum lies medially. The anterior part of the body of the fornix, the choroid plexus, lateral dorsal surface of the thalamus, stria terminalis, and caudate nucleus, form the floor of the lateral ventricle. See the image below. Ventricles and the borders of major adjacent anatomy. Capillaries of the choroid arteries from the pia mater project into the ventricular cavity, forming the choroid plexus of the lateral ventricle (see the image below). The choroid plexus is attached to the adjacent brain structures by a double layer of pia mater called the tela choroidea. The choroid plexus extends from the lateral ventricle into the inferior horn. The anterior and posterior horn have no choroid plexus. The fourth ventricle is connected to the third ventricle by a narrow cerebral aqueduct. The fourth ventricle is a diamond-shaped cavity located posterior to the pons and upper medulla oblongata and anterior-inferior to the cerebellum. The superior cerebellar peduncles and the anterior and posterior medullary vela form the roof of the fourth ventricle. The apex or fastigium is the extension of the ventricle up into the cerebellum. The floor of the fourth ventricle is named the rhomboid fossa. The lateral recess is an extension of the ventricle on the dorsal inferior cerebellar peduncle. The total CSF volume contained within the communicating system in adults is approximately 150 mL, with approximately 25% filling the ventricular system. CSF is produced at a rate of approximately 20 mL/h, and an estimated 400-500 mL of CSF is produced and absorbed daily. The ventricles are lined by a single layer of ciliated squamous or columnar ependymal cells. The ependymal cells develop from tanycytes, types of transitional cells with radially extending processes, which come in contact with the blood vessels, neurons, and glia. The blood-brain barrier is formed by capillary endothelial cells, pluripotent pericytes, a dense basement membrane, and perivascular end-feet of astrocytes. The vascular endothelial barrier is formed by tight junctions and adherence junctions between endothelial cells. Cerebral capillary endothelial cells lack fenestrations, have fewer pinocytic vesicles, have an increased number of mitochondria, and have a thicker basement membrane (30-40 mm thick) and adjacent astrocytic end-feet relative to the systemic endothelial cells. A single cell usually spans the entire circumference of a cerebral capillary lumen. In the blood, the CSF barrier and epithelial cells of the plexus are connected by tight junctions, forming a continuous layer that permits the passage of selected substances. The capillaries of the choroid plexuses have more fenestration than the brain capillaries. The choroid plexus capillaries are separated from the choroidal cells by a basement membrane and a layer of connective tissue. The ependymal cell form the lining of the ventricles and are continuous with the epithelium of the choroid plexus. Intracranial pressure is the pressure within the closed craniospinal compartment, which encompasses 3 main components: brain parenchyma, intracranial cerebrospinal fluid (CSF), and cerebral blood volume. An increase in CSF pressure happens as a result of an increase in the intracranial volume (eg, tumors), blood volume (with hemorrhages), or CSF volume (eg, hydrocephalus). Blocking the circulation of the CSF leads to dilatation of the ventricular system upstream to the level of obstruction, defined as hydrocephalus. The old classification divides hydrocephalus into 2 types: noncommunicating and communicating. In noncommunicating or obstructive hydrocephalus, the CSF accumulates within the ventricles as a result of an obstruction within the ventricular system (most commonly at the level of cerebral aqueduct). In communicating hydrocephalus, the CSF flows freely through the outflow foramens of the fourth ventricles into the arachnoid space. Coronal magnetic resonance image shows a colloid cyst (arrow) in the roof of the third ventricle. The patient has mild hydrocephalus. Intraventricular obstructive hydrocephalus refers to hydrocephalus resulting from an obstruction within the ventricular system (eg, aqueductal stenosis). The continuous production of the CSF leads to dilatation of one or more ventricles, depending on the site of obstruction. In the acute obstruction phase, transependymal flow of CSF may occur. The gyri are flattened against the skull. If the skull sutures are not calcified, such as in children younger than age 2 years, the head may enlarge. Hydrocephalus causes symptoms mainly due to increased intracranial pressure. The symptoms and findings vary with age. Clinical features of hydrocephalus in infants include irritability, lethargy, poor feeding, vomiting, and failure to thrive. In older children and adults, morning headache associated with vomiting, diplopia, gait dysfunction as a result of stretching of the paracentral corticospinal fibers, coordination problems, and impairment in the higher functions are seen. Macrocephalus, cracked pot sound with percussion, separation of sutures, frontal bossing, or occipital prominence is usually seen in children with hydrocephalus that developed before the closing of the cranial vault. Papilledema, exudates or hemorrhages, and optic atrophy may be seen upon funduscopic examination in children or adults. Enlargement of the blind spot is also noted. The etiologies and pathogenesis of hydrocephalus include overproduction, blockage, or diminished absorption. The only known etiology of excess production is choroid plexus papilloma, which accounts for less than 2% of childhood tumors. Porencephaly refers to hemispheric cysts resulting from the destruction of immature brain parenchyma, which may or may not communicate with the lateral ventricle and subarachnoid space. FitzGerald MJT, Folan-Curran J. Clinical Neuroanatomy and Related Neuroscience. 4th ed. Philadelphia, Pa: WB Saunders; 2002. Waxman SG. 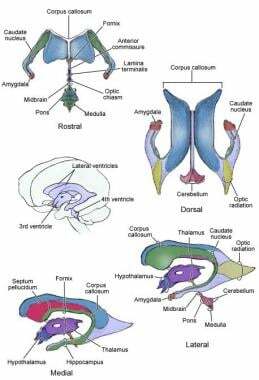 Ventricles and coverings of the brain. Correlative Neuroanatomy. 24th ed. New York, NY: Lange Medical Books/McGraw-Hill; 2000. 153-68. Fenichel GM. Clinical Pediatric Neurology: A Signs and Symptoms Approach. 5th ed. Philadelphia, Pa: Elsevier Saunders; 2005. Irani DN, ed. Cerebrospinal Fluid in Clinical Practice. Philadelphia, Pa: Saunders; 2009. Gilman S, Newman SW, eds. Cerebrospinal fluid. Manter and Gantz's Essentials of Clinical Neuroanatomy and Neurophysiology. 10th ed. Philadelphia, Pa: FA Davis; 2003. 227-33. Ransohoff J, Shulman K, Fishman RA. Hydrocephalus: a review of etiology and treatment. J Pediatr. 1960 Mar. 56:399-411. [Medline]. Rekate HL. A contemporary definition and classification of hydrocephalus. Semin Pediatr Neurol. 2009 Mar. 16(1):9-15. [Medline]. Castillo M. Neuroradiology Companion: Methods Guidelines and Imaging Fundamentals. 2nd ed. Philadelphia, Pa: Lippincott-Raven; 1999. Wall M. Idiopathic intracranial hypertension (pseudotumor cerebri). Curr Neurol Neurosci Rep. 2008 Mar. 8(2):87-93. [Medline]. Ishikawa M, Oowaki H, Matsumoto A, Suzuki T, Furuse M, Nishida N. Clinical significance of cerebrospinal fluid tap test and magnetic resonance imaging/computed tomography findings of tight high convexity in patients with possible idiopathic normal pressure hydrocephalus. Neurol Med Chir (Tokyo). 2010. 50(2):119-23; discussion 123. [Medline]. 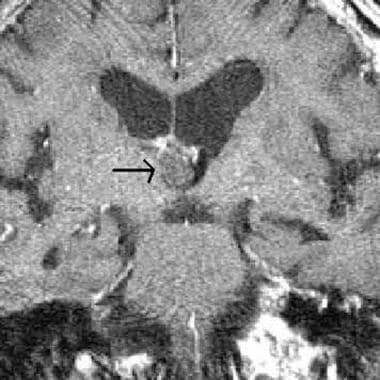 Black PM, Ojemann RG, Tzouras A. CSF shunts for dementia, incontinence, and gait disturbance. Clin Neurosurg. 1985. 32:632-51. [Medline]. Dhungana S, Sharrack B, Woodroofe N. Idiopathic intracranial hypertension. Acta Neurol Scand. 2010 Feb. 121(2):71-82. [Medline]. Eggenberger ER, Miller NR, Vitale S. Lumboperitoneal shunt for the treatment of pseudotumor cerebri. Neurology. 1996 Jun. 46(6):1524-30. [Medline]. Fridley J, Foroozan R, Sherman V, Brandt ML, Yoshor D. Bariatric surgery for the treatment of idiopathic intracranial hypertension. J Neurosurg. 2010 Jan 22. [Medline]. Schwedt TJ, Dodick DW. Spontaneous intracranial hypotension. Curr Pain Headache Rep. 2007 Feb. 11(1):56-61. [Medline]. Koivisto AM, Kurki MI, Alafuzoff I, Sutela A, Rummukainen J, Savolainen S, et al. High Risk of Dementia in Ventricular Enlargement with Normal Pressure Hydrocephalus Related Symptoms1. J Alzheimers Dis. 2016 Mar 22. [Medline].